Verizon announced that the Droid Turbo smartphone by Motorola will be available starting October 30 from its online and retail stores. It comes in a choice of a durable “Ballistic Nylon” build, or a “metalized” Kevlar fibre build. The Droid Turbo has been priced at $199.99 (approximately Rs. 12,250) for the 32GB model with new two year activation or $25 per month on Verizon Edge, and will be available in Metallic Black, Metallic Red, and Black Ballistic Nylon models. The 64GB variant comes at $249.99 (approximately Rs. 15,300) with new two year activation or $27 per month on Verizon Edge, and will be available in Black Ballistic Nylon. As expected, the new Motorola Droid Turbo comes with some top-notch specifications, such as a QHD display – which has been seen on smartphones such as LG G3 and Samsung Galaxy Note 4, and is perhaps the highlight of the device. It features a 5.2-inch QHD (1440×2560 pixels) display offering a pixel density of 565ppi, much higher than the 5.5-inch LG G3 at 534ppi and 5.7-inch Galaxy Note 4 at 515ppi. The screen also includes Corning Gorilla Glass 3 protective layer. The smartphone is powered by a quad-core Qualcomm Snapdragon 805 processor clocked at 2.7GHz coupled with an Adreno 420 GPU and 3GB of RAM. The Android 4.4.4 KitKat-based Droid Turbo features water-repellent nano-coating and is claimed to be ‘water resistant’, as per Motorola. The Droid Turbo features with a massive 3900mAh battery, the biggest amongst some of the high-end phones such as Sony Xperia Z3, Samsung Galaxy S5, Samsung Galaxy Note 3, and even Moto X (Gen 2). The company claims that the smartphone can deliver up to 48 hours of mixed usage. The Droid Turbo also supports Motorola’s Turbo Charger, a new accessory from the company stables that is said to provide 8 hours of battery life in just 15 minutes of charging. Motorola’s latest flagship handset, the Droid Turbo, have been leaked multiple times ahead of its official unveiling. 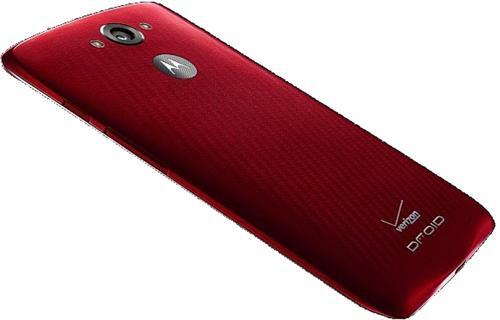 Just as all leaks, images and rumors have suggested, the Motorola-made Droid Turbo is a supersized Moto X (2014), with an all-together different branding. The Motorola Droid Turbo sports a 21-megapixel rear autofocus camera with f/2.0 aperture and dual-LED flash. The rear camera comes with features such as slow motion video; burst mode; auto HDR; Panorama, and tap to focus. Meanwhile, it can also record 4K videos at 24fps. It includes a 2-megapixel front camera. The Motorola Droid Turbo supports 4G LTE with LTE Cat 4, apart from CDMA, EVDO Rev A, GSM/ UMTS/ HSPA+ (depending on the plan chosen). The Droid Turbo also includes features from the Moto X (Gen 2) such as the Moto Display, which can wake up the phone to show the time and notifications when user’s reach for the phone. Other pre-installed apps include Droid Zap app, feature that makes sharing of images and videos easy with nearby friends, and Zap to TV, which uses Google Chromecast to create a slideshow on a big screen. The Metallic Red and Metallic Black variants measure 143.5×73.3×10.6mm, while at the thinnest the handset measures just 7.8mm. It weighs 169 grams. The Black Ballistic Nylon model, on the other hand, comes with dimensions 143.5×73.3×11.2mm, while measures 8.3mm at the thinnest. It weighs 176 grams. The handset includes accelerometer, ambient light, e-compass, gyroscope, Infrared, and proximity sensors.